A tribute to Irfan Malik (1965-2014). It is extremely rare to come across a person who actually touches something inside us, releases something creative buried deep inside and makes us challenge ourselves to find the best that we can be. If we are lucky, we have friends who bring us joy, family to care for us – and that really is a lot. But someone who can be both friend and mentor, teach without sounding like an authority figure, that is an uncommon and extremely special relationship. For me, this person was Irfan Malik. It remains the greatest gift anyone has ever given me. I remember starting my job at the Herald over a decade ago, impressionable and overconfident, brimming with grand ideas and assured of my writing abilities. Even to this version of myself, Irfan cut a daunting and scary figure. He was quick to speak his mind, unforgiving when presented with poor writing, attentive to detail almost to a fault and outspoken in his political views. He was said to be hard to approach and not always willing to build new relationships. Admittedly, for some people Irfan could be difficult to get along with. As it turned out, in my experience, this was quite untrue. Others who found him brusque at first got to know and became friends with him over the years. Some did not. Irfan was always available to talk about writing and editing and, as we became friends, much else. I spent hours observing him edit, learning from the changes he made to my copy and talking to him about my writing. In trying to learn from him, I ended up spending much of my time at work in his company. Listening to music in his office, cracking absurd jokes, – he had a great sense of humour and an unforgettable laugh – arguing about cricket and discussing writing and editing. I learnt to write, to think and in watching him cut up and put back together my writing, I learnt a little humility as well. Irfan would make mediocre pieces of writing shine and turn poorly written copy into gripping stories, all the while retaining the original voice of the writer. Once you had your writing edited by Irfan, no one else would ever be good enough. He had an uncanny way of making you feel good about your own work even though he had changed it and left his imprint on the article. I have spent all my years since leaving the Herald trying to implement the lessons he taught, striving to write as poetically and precisely as he did. Irfan spent much of his journalistic career at the Herald. It was there that he made a name for himself after his return to Pakistan from Hamilton College where he studied English and won a prestigious writing award. During his years at Hamilton, he followed the Grateful Dead from coast to coast, participated in political protests, briefly managed an aspiring rock band, and left behind many friends. The outpouring of stories and remembrances upon his death only demonstrates how truly special a person he was. After leaving the Herald in 2002, and a brief stint at the Aga Khan University, Irfan spent time at The News and then settled in DAWN’s editorial department. His scathing and sardonic opinion pieces from the paper are worth re-reading for their analytical insight and semantic brilliance. I knew him well enough to know that the life he was living was not the one he wanted or had imagined. Such statements were not uncommon. He spoke most fondly of his days at Hamilton College where, from the way he described it, he was surrounded by a vibe that in his memory was full of meaning and promise. Irfan exemplified the fact that despite their strength and brilliance, people also juggle frailties and vulnerabilities and that the daily struggle of living is finding a balance between the two. And so it was that he judged himself by his own lofty standards. Somewhere in a trunk or on a hard drive there is, I like to believe, a treasure trove of unfinished work, potential masterpieces, decaying in a Kafkaesque manner, hidden from the rest of the world. Whatever strength or generosity allowed him to help others realise their potential he did not keep in reserve for himself. I just hope that he knew what he was passing on to me and to the many others who worked with him over the years. Of how empowering and impactful the words he gave us truly were – and always will be. As I write this, I realise that no words that I can ever type will be adequate to eulogise Irfan. A close friend of mine, who is also Irfan’s niece, told me recently that his family members often jested that he would read the dictionary in his spare time. Those who played Scrabble with him would have to concur. These are scattered thoughts and such is the nature of writing about someone you admired, loved, and have now lost. All I can think of is wanting to talk to him just one more time. There is much I would like to say. 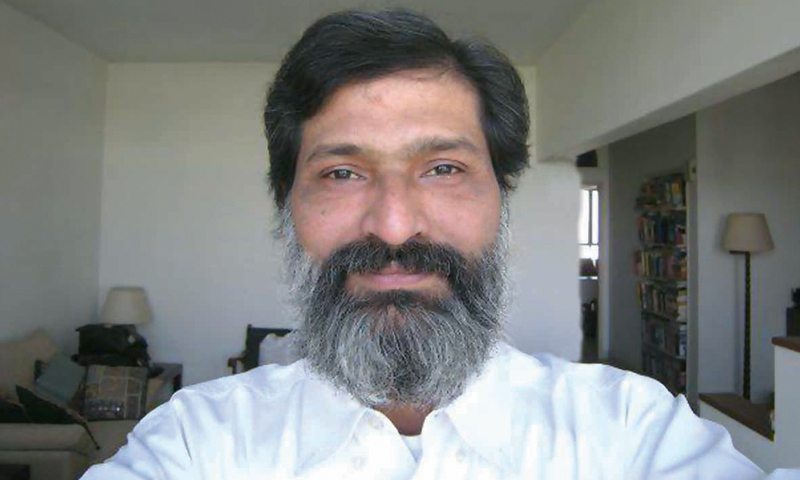 On April 7, 2014, Irfan Malik passed away as a result of ongoing health complications. He leaves behind two well-loved 14-year-old Golden Labrador Retrievers, Gogi and Laila, over whom he doted, and a host of friends and admirers. Some, I am certain, wonder whether he knew about the impact he had on their lives. The world will be a lesser place without you, Chief. I guess he was ready to fade into his own parade, to paraphrase Bob Dylan. Irfan would have known what this means.